The first part of the Faction Update is in! Faction Leaders now have the ability to ally their factions with other factions. To do this, simply use the "Allies" power under the Faction -> Admin panel and enter the name of the faction you wish to ally with (only Faction Leaders may use this power). This panel will also show all current faction allies, all pending requests by your faction for alliances, and all requests by other factions to ally with your faction. To accept an Alliance, simply click on their request in the Allies panel, and an alliance will be formed between your two factions. To break an alliance, simply click on an active alliance in the same panel (there is a warning message about this to prevent "accidents"). When one side breaks the alliance it becomes broken for both factions involved. Note: This is only the first part of the Alliances system, a second update will be going in soon that will change how Alliance members can interact while deployed (ie. cannot attack each-other, Faction bases will not fire on allies, etc.). Please test out the current system and get your alliances ready-to-go! Updates have been a little dry over the last week, so I want to take a moment to give a heads-up about what's going on in the world of Tinywarz - what's happening and what's planned. Currently a lot of work is being done outside of the game, a few partnerships are being lined up which should bring in a healthy dose of fresh-blood. These are taking a lot of time and don't really warrant a game-update, hence the lack of new posts on this page. "Things to spend Faction Points on." These abilities are still being flushed out, the idea is that they should be good, but not so good that they give the purchasing Faction an "I-WIN" button. Several ideas have been tossed around including the ability to exchange faction points for credits. If you have a suggestion please post it in the thread linked below. A "neat" new faction feature is also coming down the pipe. Coding is about 50% complete and it will provide a new way for factions to interact with other factions. Also on deck (but last in the queue) is a major re-write to pages that become very difficult to manage for users with a high number of vehicles, crews, construx, etc. These include, Headquarters -> Units, Manage Forces -> Modify Units and Faction -> Storage. This is going to be a major headache of an update (because these pages will mostly need to be re-built from scratch), but it is definitely needed. Lastly, (I don't want to write too much about this) a batch of "high-end" content is planned. These will be features that will not only challenge large factions and high-level players, but also provide some depth to the world of Tinywarz =) ... I don't want to say too much about this update because it will not work like other updates to the game - it will be up to you, the players, to discover and work through this content (however, a message will appear when it is ready). Please post any feedback to this update in this thread. Some multi-session code started acting up today. This caused players to log-out just as they logged in, it has been fixed. Also, when you deploy to a planet, you now deploy without your base by default (it was the other way around). This was requested because players deploy more often without a base than with one. Also, the cookie code for the front-page has been fixed ... you should now be able to properly save your email address in the login box. Some last chat bugs have been ironed-out. Thanks to everyone who helped get the new chat system up-to-speed. Also it was suggested by a player (pyroknight) there should be an easier way for current players to help out newer ones. This has led to the creation of the Tinywarz Newbie Helper program. Experienced players who wish to be Newbie Helpers can add a post to the Newbie Helper post in the Beginner's Area forum. New players are encouraged to seek players who post to this forum out for questions or advice on how to play Tinywarz. Some final code changes are being made to the new chat code. Also, a large chunk of the interface code is being moved over to minic the new chat code. This should make it easier see see when you are given Credits, Ore, Command and when the nightly update runs. Also Paypal is a little sluggish today ... If you make a purchase, please email me in-game so I can speed up the processing for you. Huge Chat Update today - the chat code has been ripped out and completely re-written (while it *looks* like the old chat, it doesn't *act* anything like it). You no longer need to push "Chat" to check for the latest messages, your chat will automatically refresh where there is new text, hence chat now acts like ... real chat! =) A ton of code went into the new chat (mainly behind-the-scenes stuff) and some bugs may still be hiding in there, if you find one please post it to the Bugs section of the forum. Small update today - factions can now set a website link that is click-able from the faction info page. Users with the MotD power can change the faction website link. Also, there was a small bug that made the Beacon disappear if it was held too long, this has been fixed. The Beacon will now always be somewhere on the map. Lastly, if the Beacon's holder is killed, the Beacon will become neutral again. Major Faction Planet update today - the way Faction Points are acquired has been completely changed. Faction Planets are currently in a Cold War: it costs thousands of Command Points to remove an enemy base and there is little to no reward for doing so. The big problem with Faction Planets is that Faction Points are earned passively (by deploying a base) not actively, this update will change that. The idea behind this update is to remove the focus from attacking a Faction Base, which doesn't happen that often and (usually) causes massive losses for both sides and shift it to smaller, more frequent, skirmishes. First off - Faction Planets now have a Beacon that can be captured and returned to the Faction Headquarters for 10 Faction Points. It costs 3 Command to capture the Beacon and the Beacon will then move with the vehicle that captured it. Vehicles that capture a Beacon cannot move faster than 4 squares per turn, and the Beacon's location will be broadcast to everyone on the planet. To capture a Beacon, a vehicle must be in the same square as it and cannot have moved that turn, the Beacon capture command can be found in the Commands menu for a unit. When one Beacon is captured, another will appear in a random location on the map. Second - Only one beacon can be in-play at a time. Once it is captured, you have 60 turns to get it to your Faction HA. If you don't, the Beacon becomes neutral and warps to a random spot on the map. If you counter-capture a Beacon (destroy an enemy unit that has the beacon and capture it), you get a fresh 60 turns to get it to your base. Fourth - The amount of Faction Points that Faction HQs provide has been reduced. 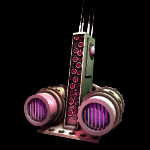 However, if one faction can control the Faction planet, it will receive just over 100 Faction points for its troubles. Two small changes today - first off, players will now see what their faction bases are doing in the Events Window on a faction planet (this includes attacks by or against faction turrets, commands issued for or against faction buildings, etc.). Second: Ground Hogs have received a small change; their Max Speed has been reduced by 1 (they are still the fastest vehicle in the game though) and their CE has been increased by 25 (from 100). A few players noticed a loss of connectivity early this morning. This was not due to the Tinywarz server crashing - two major internet backbones went down (article here). Unfortunately, outages (although infrequent) are part of internet games and there isn't much that can be done in these cases.